Atosa MBB59 Stainless Steel Back Bar Cooler, 59"
TigerChef > Browse by Store Type > Bar Supplies > Bar Equipment >< Back Bar Coolers > Atosa MBB59 Stainless Steel Back Bar Cooler, 59"
$2,877.93 Beverage Air BB58G-1-B 2 Section Glass Door Back Bar Refrigerator 59"
$3,310.54 Beverage Air BB58G-1-S Stainless Steel 2 Section Glass Door Back Bar Refrigerator 59"
$2,170.13 Turbo Air TBB-2SB-N6 2-Section Solid Door Black Back Bar Refrigerator 59"
$2,371.79 Turbo Air TBB-2SG-N 2-Section Glass Door Black Back Bar Refrigerator 59"
$3,281.99 True TBB-2G-S-LD Stainless Steel 2 Section Glass Doors Back Bar Refrigerator with LED Lighting 59"
$3,039.99 True TBB-2-S Stainless Steel 2 Section Back Bar Refrigerator 59"
$2,843.99 True TBB-2G-LD Black 2 Section Glass Doors Back Bar Refrigerator with LED Lighting 59"
$2,552.99 True TBB-2 Black 2-Section Solid Doors Back Bar Refrigerator 59"
Equip your bar area with the Atosa MBB59 Stainless Steel Back Bar Cooler, 59". Great for storing drinks, ingredients and other bar essentials, this bar cooler is an indispensable addition to any food service establishment. 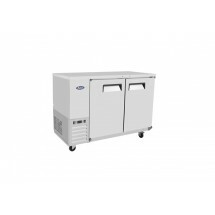 Featuring a stainless steel interior and exterior, this bar cooler will keep up with the rigors of high volume use. 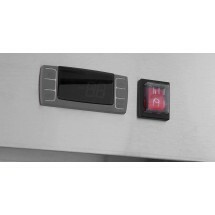 Equipped with 2 recessed handled doors which close automatically, this bar cooler is an energy saver. 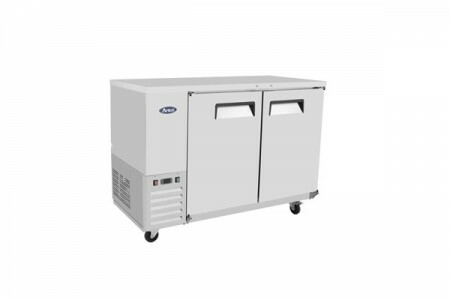 Built with a Dixell digital temperature control system and a heavy-duty Embraco compressor, this cooler will provide reliable refrigeration. 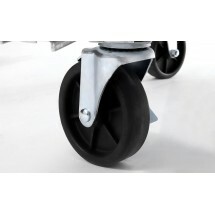 Thanks to its pre-installed swivel casters with bumper and breaks, this bar cooler is easy to maneuver around your facility. Dimensions: 57.8" x 28.1" x 42.2"